In a new ViDoc which was published yesterday Bungie have unveiled their plans for Destiny 2 Black Armoury and the content coming to the game well beyond that in both Joker’s Gambit and Penumbra. Check out the video at the end of the article. Firstly, Bungie are completely changing the way they’re releasing DLC for our beloved Destiny 2, but for the better. No longer are we going to have massive content drops with nothing but smaller live events, such as Iron Banner, in-between. Now we’re getting seasons which mark the launch of new content in the game, both for players with the base game and those with the Annual Pass. 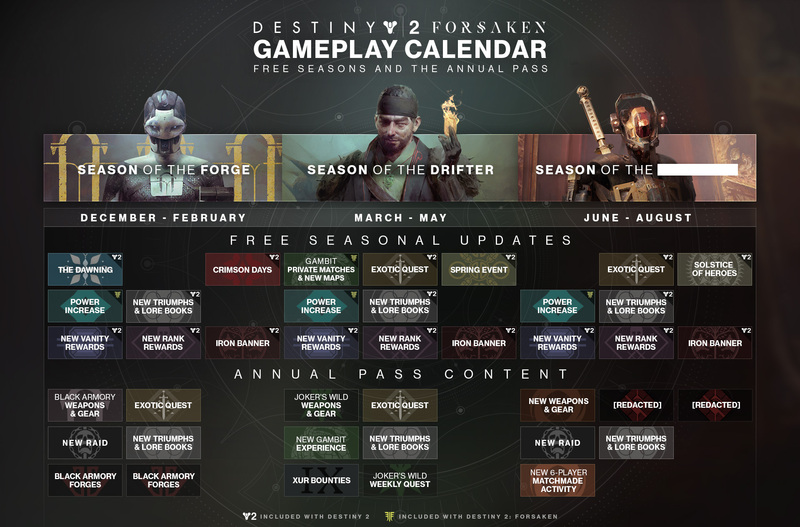 The Annual Pass owners will get access to exclusive content, and that applies for the next three seasons including the current Season of the Forge. We’re going to dive into the specifics in more detail over subsequent articles, but for now we’ll give you an overview of what’s coming in Black Armoury, as well as what we can see so far that’s planned for future seasons. Black Armoury is launching on the 4th of December, which we already knew, but the Power Level cap is also being raised to 650. The cap is going to go up by 50 every season, at least right now it is, which should give us something to chase in the time between content drops. Gaunt, the character we talked about being the new vendor for the Black Armoury, is actually Ada-1. She is an Exo who’s been hiding in the Black Armoury, and hiding the armoury itself, since the Golden Age. She doesn’t trust the City, the Vanguard, or us Guardians, but she needs our help all the same. Four family forges have been lost to the Black Armoury, and Ada-1 wants us to go out and reclaim them. These forges will release over time, and will act as three-player activities with matchmaking in a horde game mode fashion. A new forge will release each week in a similar way to the Ascendant challenges in the Dreaming City. A new raid is coming; Scourge of the Lost. This new raid sees Guardians return to the City, drive around in mad-looking vehicles, and fight enemies in fun, frantic combat similar to the Wrath of the Machine raid in Destiny 1. There are 5 new Exotics coming with Season of the Forge, these all look and sound fantastic but we’re not going to cover them just yet. You’ll have to wait for our further analysis of them in a later article so be sure to follow us on social media to avoid missing the specifics. We’ll also be discussing the fantastic news of the return of Machine Guns to the Destiny universe. Finally, we have a roadmap image of what’s coming in Destiny 2 for the current season, and the next two. Again, we’re going to discuss this in a later article very soon, but for now you can at least look at it here in the article (it’s the main image) and get a good idea of what’s coming. If you needed an excuse to purchase that Annual Pass this is certainly it. Let us know what you think in the comments. Next articleWhat Are the New Exotic Weapons In Destiny 2 Black Armoury? From The Beta – How Different Does Destiny 2 Feel To Play?